Find My Workspace lists over 95% of the business centres market in Banbury. Simply click Request Quote to check pricing for one office, or Add to Basket for multiple offices. 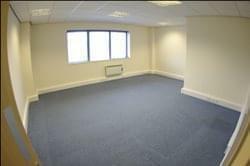 Modern purpose-built office space available on a furnished basis with dedicated kitchen and rest room facilities. Both serviced offices and co-working space are offered at this centre. There are two meeting rooms which can accommodate up to 20 people which can be used for interviews, staff training or other business meetings. The centre is equipped with high speed WiFi and CCTV system and is accessible 24-hours a day. There are staff on-site seven-days a week which ensures there is on-site management on hand to give help and assistance to tenants. There are also postal facilities and an on-site cleaner at the centre. The office space is of a modern feel and is a great place to work from, providing comfortable workable space in a quiet surrounding. This contemporary office space has many amenities to suit your business needs. 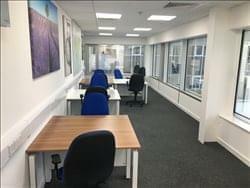 With flexible business rates, service chargers, maintenance electricity and water all included, you’ll find this a space perfect for any hard-working aspiring business. Make use of the shared meeting room to entertain your clients and even have your own business sign over the entrance of your own personalised office. Ample parking is available on site, alongside 24 hour security to provide safety for you in the workplace. The suite can also provide you with your own personal, private, clean, dry and secure storage room from 10-500 sq ft in the adjacent warehouse storage units via a corridor from the office lobby.